Bypass capacitors play a vitally important role in electronic circuit design. Many people do not know the proper way for deciding which capacitor or capacitors is/are needed for effective noise and/or signal bypassing without either overdoing or underdoing it. Needs change over the years as frequencies and signal characteristics occupy new realms of the spectrum. A Fourier analysis of some of today's complicated waveshapes for switching power supplies shows how sometimes tailored responses to bypassing is required. 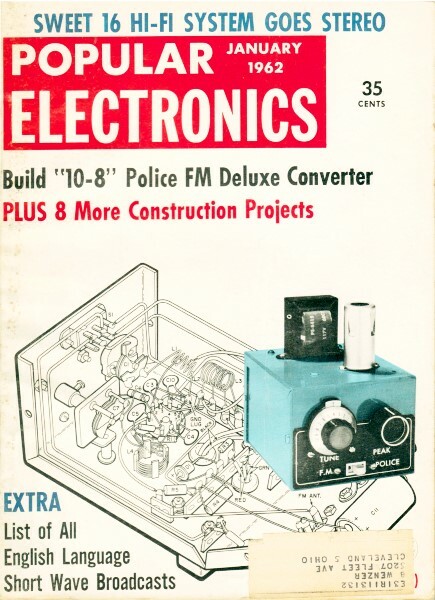 This article from the January 1962 Popular Electronics does not delve into the intricacies of complex filters, but it does provide a nice introduction to the need for bypassing and how to stand a good chance of being successful at it. In rare instances, no amount of bypassing will solve problems with spurious signals and a more engineered approach is required where the functional circuit needs to be modified (I know this from experience!). Here is an article written by RF Cafe contributor Carl Lodstrom on the subject of bypassing. Capacitors are used in modern electronic circuitry for such purposes as blocking, filtering, timing, and bypassing. The last-mentioned application - bypassing - is by far the most common. It's also much more critical than many people suspect, since the selection of a wrong-value bypass capacitor can result in poor frequency response, phase distortion, circuit instability, or even outright oscillation. Now, you may feel that this problem is no concern of yours, but is rather one for the design engineer. "Shucks," you say. "If a capacitor-bypass or otherwise - goes bad, I'll replace it." This approach works fine in most cases. But how many times have you wished you could help fix a piece of equipment after a well-intentioned, but poorly instructed, do-it-yourself fan has been hard at work with his trusty soldering gun? Or how many times have you felt like throwing that cheap "screech-box" receiver out of the window, when a 15¢ bypass capacitor would do much to quiet the demon of temptation? Finally, remember that despite our ultra-modern manufacturing methods, "goofs" are still made by people who do the physical wiring and inspection but who know nothing about the workings of the circuit. If you're now convinced of the importance of knowing a little more about bypassing (and shame on you if you aren't), let's get on with the job. where Xc is the capacitive reactance in ohms, 2π is a constant (approximately 6.28), f is the operating frequency in cycles per second, and C is the capacitance in farads. This relationship tells us that the reactance of a given capacitor decreases as frequency increases. For example, the value of Xc for a 0.01-μf. capacitor at a frequency of 500 cycles is about 31,800 ohms. But at a frequency of 5000 cycles, the reactance has decreased to about 3180 ohms. where all symbols have the same meaning as before. For example, if we want to know what value capacitor will provide a reactance of 18 ohms or less at a frequency of 500 cycles, we just substitute known values in the above formula. The calculated answer is 17.7 μf., approximately, but the next highest standard capacitance value available will be okay for most applications. Audio-Frequency Amplifiers. In a typical audio-frequency amplifier, such as that shown in Fig. 1, a capacitor, C1, is used to bypass audio frequencies around the cathode resistor, R1. If capacitor C1 is omitted or if it does not operate properly, the a.c. plate current component develops a voltage drop across R1 which opposes the input signal applied to the grid. This effectively reduces stage gain and results in inverse feedback or "degeneration." Fig. 1. Cathode bypass for audio amplifier stage. Now, let's see what requirements are placed on the capacitor if it is to prevent degeneration. Suppose the amplifier is to pass all frequencies between 100 and 5000 cycles, and the value of cathode resistor recommended by the manufacturer for class A operation is 1500 ohms. Because the reactance of the capacitor decreases as frequency increases, a capacitor that satisfactorily bypasses the resistor at the lowest frequency will work quite nicely over the entire range. An electrolytic capacitor is suitable for this purpose because its leakage resistance is not important and high capacitance is obtained in a compact size. In some applications, such as high-quality audio amplifiers, the ratio of resistance to reactance at the lowest frequency passed is made 20 to 1 or even higher, but the ratio used in our example is adequate for most cases. Needless to say, the working voltage of the capacitor selected for any bypassing applications must be larger than the maximum voltage present. 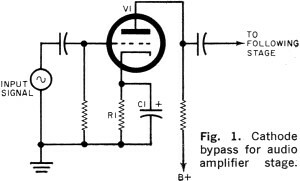 Bypassing in the case of a transistorized audio-frequency amplifier is very similar. A typical pnp transistor amplifier, using the common-emitter arrangement, is shown in Fig. 2. Base bias is obtained from the voltage-divider network, consisting of R1 and R2, and the emitter is forward-biased (negative in the case of a pnp transistor, and positive for the npn type). To prevent signal degeneration, the emitter-bias resistor (R3) is bypassed with a high-value electrolytic capacitor (C1). Fig. 2. 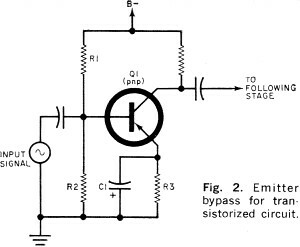 Emitter bypass for transistorized circuit. In either type amplifier discussed above, a certain amount of degeneration is sometimes intentionally used. Therefore, before jumping to any wrong conclusion, always make sure that degeneration is in fact undesirable before attempting to correct a case of "faulty" design. If bypassing is improved where degeneration is needed, the circuit will not operate properly. Other Applications. When a pentode-type tube is used, additional bypassing is needed in the screen grid which must operate at ground potential, as far as all signal voltages are concerned, if degeneration is to be avoided. A typical case is the television i.f. 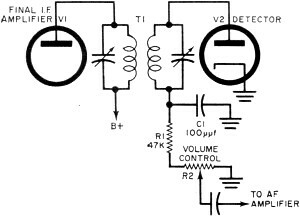 amplifier shown in Fig.3. Fig. 3. Screen bypass for typical i.f. amplifier in a television set. 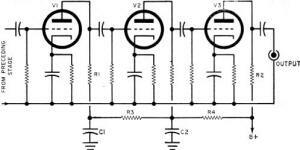 In this circuit, screen potential is obtained from the plate-supply source through the screen-dropping resistor, R2. 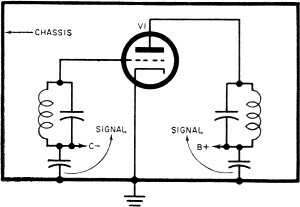 If bypass capacitor C1 fails to operate properly at any frequency, the gain of the amplifier falls off at that frequency. The value of C1 is again determined by the rule-of-thumb that its capacitive reactance at the lowest frequency passed should not exceed one tenth the value of the resistor it bypasses. Generally, mica or ceramic capacitors, ranging in value from about 50 μμf. to 0.01 μf., are used for r.f. bypassing arrangements of this type. If the pentode is employed as an audio-frequency amplifier, high-quality paper or electrolytic capacitors are used. Their proper value can be determined in the same way. Sometimes it is necessary to bypass radio but not audio frequencies. 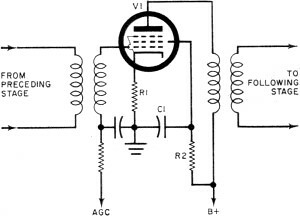 A typical case is in the detector circuit of an AM receiver, as shown in Fig. 4. Assuming that the r.f. carrier frequency is 455 kc., if the reactance of C1 is to be one-tenth the value of R1 at this frequency, its value - using the formula previously given - is approximately 75 μμf. We would use a standard 100-μμf. mica or ceramic capacitor. If the highest audio frequency to be passed is 5000 cycles, the reactance of the capacitor at this frequency is better than 300,000 ohms. Fig. 4. R.f. bypass for diode detector stage. 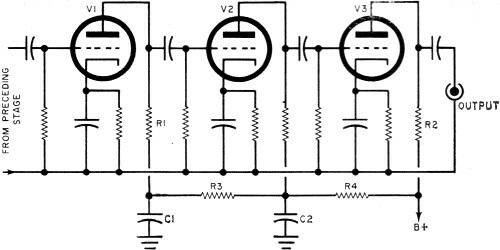 Another circuit in which bypassing is important is illustrated in Fig. 5, where three amplifier stages are fed from a common plate-voltage supply. Since most power supplies possess a finite impedance, the output of V3 will be returned to the plate circuit of V1 through load resistors R2 and R1. This effective signal voltage is then fed to the grid circuit of V2 and then into V3. Naturally, if the gain of these stages is high enough, oscillation occurs. Fig. 5. Decoupling is required because of feedback through R1 and R2. To prevent instability of this type, decoupling networks are used, a typical example of which is shown in Fig. 6. The reactance of C1 and C2 at the lowest operating frequency is made very small compared to the resistance of R3 and R4. Because R3/C1 and R4/C2 form voltage dividers, almost the entire voltage developed across the common impedance is dropped by R3 and R4. Essentially, no feedback voltage is then coupled into the plate circuit of V1 or V2. Fig. 6. Networks R4/C2 and R3/C1 prevent undesired feedback between stages. where XL is the inductive reactance in ohms, and f is the operating frequency in cycles per second. Chassis Grounds. Here's a final word about connecting bypass capacitors. At frequencies of 30 mc. and below, the dimensions of the chassis are usually only a fraction of a wavelength, and it can be considered a fixed reference. Above 30 mc., however, the chassis is essentially a conducting sheet on which points of maximum current and voltage appear. In the circuit of Fig. 7, grid and plate "ground" currents pass through the chassis to the cathode of the stage. A good practice, generally, is to separate these ground currents from the chassis by returning all leads to the cathode or a bus bar. Just be sure, however, that the leads are kept as short as possible to prevent cross-coupling and undesirable feedback. Fig. 7. Decoupling capacitors should be grounded at one point for best results at high frequencies.